In a volunteer organization or non-profit, spreading the word on opportunities to connect and share is where social media shines. When a group, or individual wants to communicate the thought to have to log in to a separate LinkedIn account, a Facebook account, a Twitter account, or other places to connect with your community is not an enticing prospect to manage. However, the time comes for communication engagement across multiple, social media accounts with communication valued for multiple community personas can seem a lot of effort. Two recommendations were made to Project Management Institute New York Chapter (PMINYC), where, I am both a card-carrying member of PMI and volunteer. Both recommendations are easily applied to other organizations or an individual who wants to launch and manage their social media identity. Communication has always been important, October’s PMINYC Seminar presents an opportunity for more people to see how and what information sharing through social media helps. 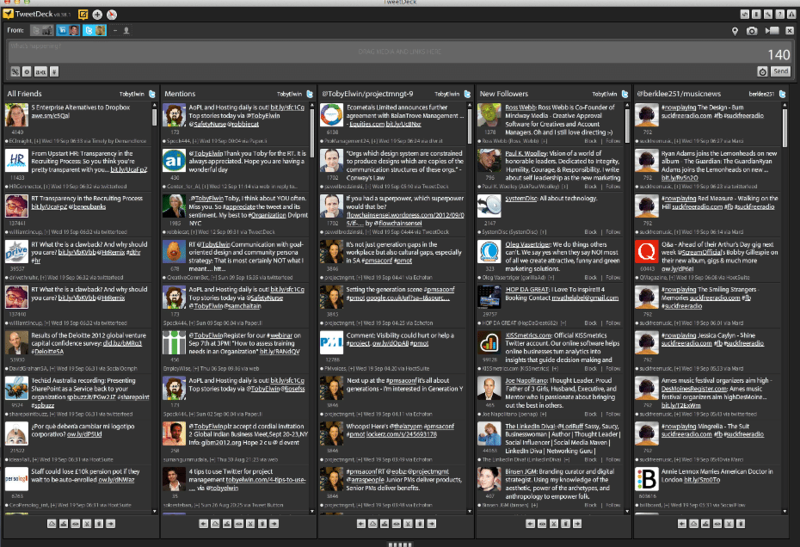 Both TweetDeck and Hootsuite work well for anyone managing many accounts. 2nd recommendation compliments the first and also improves other social media efforts: Create a bit.ly account, if PMINYC does not already have one. This free link shortening service takes a link, such as: http://tobyelwin.com/community-persona-for-sharepoint-intranet-design/ and shorten it to this: http://j.mp/RuOWDB. Toby – these are indeed good tools to use to manage twitter and your tweeting schedule, along with other social media platforms. Thanks.As a non-profit, once target persona(s) are identified, what strategy should be used? Of course you will have a \’corporate\’ twitter account for announcements, service request resolutions, and other \’corporate\’ functions (marketing, conversation, etc.). How do you go about popularizing hashtags and sparking the conversation with others (be they followers or not)? How would you structure the social media support team to maintain the conversation?Appreciate your insight on this. The preeminent strategy is first listen. See how the conversations flow. People use the hashtag (#) to identify a word. The word is tracked into a stream and is searchable. Twitter has it’s own search engine for ‘#’ followed by characters. What comes up are people Tweeting and identifying their tweet within #pmi conversation, if you want to see what people are talking or what is trending, use a ‘#’ with word or acronym combinations. Follow those people with Tweets you liked. What comes up? Follow those people with Tweets you like. You may have corporate accounts for those areas or departments. You spark conversations by joining and contributing valued insight. Listen, learn, retweet (extensively) with your comment on the value, acknowledge, repeat [multiple genuine times], create useful content by linking to articles you thought of value, then build your reputation as someone who is worth listening to. A blog I think may help the Twitter learning curve might be 4 tips to use Twitter for project management. Also, Twitter has a good introduction, after all they want people to join the conversation, not feel out of place at the party: Twitter 101: How should I get started using Twitter? Why do I always default to Twitter in my talks or seminars: if you can not provide valued insight in 140 characters (the Twitter limit) you can not provide value no matter the amount of space. Learn Twitter and micro-blogging and you learn the rules of engaging engagement with other social media tools. You come to the dinner party with a bottle of wine (or port or sake) so once in a social media conversation bring something: come bearing gifts. People just make their own hashtags up all the time. Its better off just tapping into the existing one and at least you know you can get some traffic from it. Creating hashtags are, like most other social media investmens, good to use if you commit to using them and pointless if a shotgun effort without strategy or reason. I absolutely agree to look first at the Twitter hastags that trend as a first step in a hashtag strategy. See what other people are writing and using it for and why it would help your effort. Creating a hashtag, for example #PMINYC, for the Project Management Institute New York Chapter is a complimentary strategy. That hashtag is both geospecific and, if the organization commits to the communication of #PMINYC, you guide someone searching for specific content. Using new hastags with established hashtags is helpful. For example: #PM #PMI #PMINYC as PM (project management) and PMI (project management institute) are established. How have you advised an initial strategy for an organization to value hashtags and adopt hashtags in their communication effort?